Faced with a highly dynamic and increasingly strict regulatory environment, the pharmaceutical packaging industry must turn towards innovation as a means to succeed. This article will present some of the recent and upcoming changes in regulations concerning pharmaceutical packaging and describe how federal and state R&D tax credits can be a strategic tool in assisting companies in adjust sting to new standards. Packaging encompasses the collection of components that surround a pharmaceutical product from its production until its use. 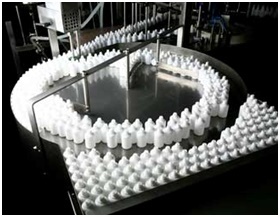 Packaging pharmaceutical products is a multi-faceted and strategic task. Packages are not only responsible for providing life-saving drugs, medical devices, and medical treatments, but they must also ensure safety, identity, convenience of handling, and proper delivery. According to research firm Transparency Market Research, the global pharmaceutical packaging market is expected to grow at a compound annual growth rate of 5.6 percent from 2012 to 2018, eventually attaining an overall market value of $73.04 billion in 2018. The expiration of patents and the consequent delivery of greater numbers of generics into the market, as well as a growing demand for customized treatments and drug delivery devices should make sure the need for pharmaceutical packaging steadily rises. Despite favorable prospects, producers of pharmaceutical packaging solutions must face various challenges, which include addressing product requirements while ensuring that customer, marketing, retailer, and supply chain needs are satisfied. The following sections give an overview of the regulatory challenges for the pharmaceutical packaging industry and how innovation can help overcome them. The regulatory landscape for pharmaceutical packaging is a very dynamic one. Designers and manufacturers must be able to comply with evolving requirements, which directly influence economics, risks, and product development. New and proposed changes in the U.S. Pharmacopeia, for instance, promise to shape future developments in pharmaceutical packaging. The U.S. Pharmacopeial Convention (USP) is a scientific nonprofit organization whose standards are enforceable in the United States by the Food and Drug Administration (FDA) and used in over 140 countries. The USP is currently updating its guidelines concerning pharmaceutical packaging. The organization aims to delineate a general and chemistry-based approach for establishing the safety and quality of pharmaceutical packaging systems and their materials of construction. 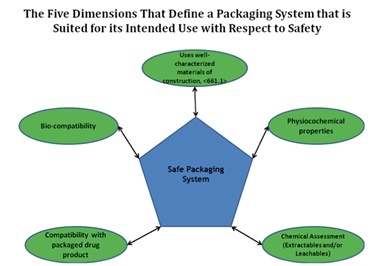 USP’s new guidelines are based on the notion that the most definitive way to establish a packaging system’s suitability for use is to test the packaged drug product, the packaging system, and the packaging system’s materials of construction and assess whether interactions, potential or real, between the drug product and the packaging system are within acceptable limits. To enable accurate suitability assessments, the organization provides standards for tests, procedures, and acceptance criteria. In the case of leachables (trace amounts of chemicals originating from the packaging system that end up as contaminants in medicinal products), USP underlines their potential impact on the safety and efficacy of products and provides guidelines for chemical analyses and toxicological safety assessments. The packaging system is chemically compatible with the packaged product, as established by appropriate compatibility assessments (e.g., stability studies). Further updates to the United States Pharmacopeia and The National Formulary (USP–NF) are planned for publication in 2015, including a revision of the chapter entitled “Packaging and Storage Requirements”, which should bring significant changes, additions, and edits to packaging definitions. In addition to industry-specific standards, pharmaceutical packaging companies must comply with broader regulations, such as the Poison Prevention Packaging Act (PPPA) of 1970, which mandates certain products to be packaged in child-resistant containers. Even though the act itself dates from over four decades, regulation is constantly evolving to match new data. In 2012, for instance, the Consumer Product Safety Commission issued a rule that requires child-resistant packaging for any over-the-counter or prescription products containing imidazolines equivalent to 0.08 milligrams or more. Imidazolines are a family of drugs indicated for nasal congestion and/or ophthalmic irritation. PPPA regulated substances are also subject to the Consumer Product Safety Improvement Act of 2008, which determined that child-resistant packaging must be tested for compliance with consumer product safety requirements in order to obtain certification. Since February 2010, manufacturers and importers must make certificates of conformity available to retailers and distributors of affected products. State level inspections are performed by Attorney General Inspectors to enforce this regulation. The regulatory environment for pharmaceutical packaging is constantly evolving. Innovation is key in helping companies keep up with ever more stringent requirements, particularly when it comes to demonstrating that a package is chemically suited for its intended use as well as developing child-resistant packaging. Federal R&D tax credits can support innovative compliance efforts and increase their chances of success. Counterfeiting is defined as “manufacturing products and packaging similar to the originals and selling the fake as authentic products.” By infiltrating legitimate supply chains, counterfeits threaten the reputation of pharmaceutical manufacturers and, more importantly, endanger the health of users. The increase in packaging forgery is a major driver of the counterfeit market, which constitutes a $75 billion global industry. In response to this daunting scenario, a growing number of countries are implementing new serialization and traceability legislations, aimed at enhancing security at the pharmaceutical supply chain. On November 27, 2013, President Obama signed the Drug Quality and Security Act (DQSA), which outlines critical steps to building an electronic, interoperable system to identify and trace certain prescription drugs as they are distributed in the United States. -Dispensers (primarily pharmacies) Establish systems for verification and handling of suspect or illegitimate product. Over the ten-year period that started in 2013, drug manufacturers, wholesale drug distributors, re-packagers, and many dispensers (primarily pharmacies) will work in cooperation with the FDA to develop a “track-and-trace” system that will 1) enable verification of the legitimacy of the drug product identifier down to the package level; 2) enhance detection and notification of illegitimate products in the drug supply chain; and 3) facilitate more efficient recalls of drug products. Title II of the DQSA, the Drug Supply Chain Security Act, imposes interim, lot-level requirements and deadlines, which are summarized in the chart above. The act further establishes item-level serialization and traceability requirements. By November 2017, product transaction data must be available electronically, and a standardized numerical identifier must be affixed or imprinted on the label at the product and case-level. Complete unit-level traceability should be achieved in 2023. Simply put, the idea behind serialization is to provide a transaction history (also referred to as pedigree) outlining all the changes in ownership of the drug - from the initial sale by the manufacturer through wholesalers, distributors, and pharmacies until it reaches the consumer. This is possible by affixing a unique and traceable serial number to every package, bundle, case, and pallet. The identifier will be read many times as the product makes its way through the supply chain and, each time, an entry will be made in a database to document custody. The new regulation should greatly benefit the pharmaceutical industry and its anti-counterfeiting efforts. However, compressed timelines and new requirements can pose significant challenges to manufacturers, which must find ways to achieve compliance while also minimizing costs and maximizing returns on investment. Innovation and industry-wide collaboration should play a central role in such comprehensive transition. Drug giant Pfizer, for instance, is already deploying serialization throughout its packaging lines. The company is also building out a cloud-based IT solution that integrates with its contract manufacturers to ensure compliance with upcoming deadlines. While some companies create internally developed solutions, others resort to commercial off-the-shelf serialization systems specially designed to meet the needs of the pharmaceutical industry. One example is Marlton, New Jersey-based Acsis, which launched “Serialization in a Box”, a complete turnkey solution that identifies, applies, and captures data at the unit, bundle, carton, and pallet level. The innovative solution combines industry-leading serialization software with cutting-edge material handling, vision, and printing equipment to create a ready-to-use serialization system that is robust, cost-effective, capable of integrating with existing equipment, and easy to deploy and maintain. The solution uses smart camera vision systems, developed by Natick, Massachusetts-based Cognex. These critical components not only validate the presence, accuracy, and readability of various labels, but also ensure product safety and package integrity. Smart cameras are an example of how crucial automation is when implementing a successful serialization strategy. If done manually, this time-consuming task undermines cost-effectiveness and becomes prone to untraceable errors. 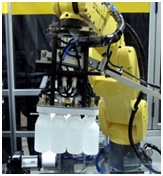 A partnership between Yardley, Pennsylvania-based Xyntek, a serialization, track-and-trace, and machine vision system integrator, and ESS Technologies, a designer, manufacturer, and integrator of packaging machinery and robotics, capitalizes on robotic automation to streamline serialization. Together with Italian company Antares Vision, they developed the TaskMate Robotic Case Erector/Loader with integrated track-and-trace capability. Using Xyntek-Antares’ Tracking System software and the Omnivision 360° Bottle Tracking System for serialization and aggregation, this innovative solution allows pharmaceutical and medical device manufacturers to automate the case packing process and provide unit-level serialization, traceability, and authentication for all of the products being packed. In addition to enabling compliance with both national and international regulations, emerging serialization solutions enhance end-to-end supply chain visibility, which can unleash significant benefits, including optimized asset performance and reduced chargebacks. In other words, even though compliance with new serialization requirements may require investment in new technology, returns should not take long. Serialization itself will generate considerable efficiency gains throughout the supply chain as it enables a comprehensive gathering of information that could help understand, streamline, and automate the processes involved. In our globalized economy, the need for an international approach further accentuates the challenges of traceability. U.S. serialization requirements are just a component in a patchwork of diverse regulations. Therefore, global companies must build harmonized solutions that allow for country-specific adaptations. The table below represents information from the most recent “Pharmaceutical Track-and-Trace Serialization Playbook” and summarizes the current state of serialization in different markets. The European Union Directive 2011/62/EU on falsified medicines drives requirements across Europe for tampered evidence, serialization and tracking. Compliance begins in 2017, and for countries with existing serialization, in 2023. In order to allow identification of a pack of medicinal products, a serial number must contain, at a minimum, a manufacturer product code and the pack number. The serial number may be combined with other product related information such as (a) packaging batch or lot number (b) expiration date (c) national reimbursement number. In China, a system has been established to track each movement of pharmaceuticals throughout the supply chain. Full implementation of the Chinese system was expected in March 2015. The Chinese National Drug Code (NDC) plus serial number is required to be printed on primary and secondary packages up to the pallet with hierarchy information for the products listed on the essential drug list, which includes 502 products. The China Drug Identification, Authentication and Tracking System provides an online portal for the registration of products and serial numbers. Saleable items are encoded with a linear ISO-128 barcode containing a 20-digit code comprised of the NDC, serial number, and check digits. Recently passed Brazilian legislation requires brand owners or importers to collect specific trade data about their products as they move through the supply chain after December 10, 2016 - information include the national drug registry number, serial number, expiration date, packaging LOT number in human readable form, and a DataMatrix symbol. Manufacturers and importers must apply the Brazilian Unique Medicine Identifier (IUM) to saleable package and bundles. Shipper cases must also have a unique identifier. After January 1, 2015, packages in South Korea must include the item’s identity as a GTIN, a unique serial number for each item, packaging LOT, and expiration date in human readable form and a DataMatrix symbol. Manufacturer must include a barcode or RFID tag on distributed pharmaceuticals that are domestically manufactured or imported. Cases must also include the same information in linear, GS1-128 barcodes. In Turkey, a 2012 law requires serializing and tracking for all unit-level items that are reimbursed by the Ministry of Health. Manufacturers must imprint the item’s identity using a GS1 GTIN, a unique serial number, the packaging lot number, and expiration date in both human readable form and a machine readable GS1-encoded DataMatrix symbol. Information is posted into the Pharmaceutical Track-and-Trace database as the goods move through the supply chain, allowing for the verification of its origins. Argentine law requires serializing and tracking using GS1 encoded DataMatrix symbols for all unit-level items that are reimbursed. Manufacturers must imprint the item’s identity using a GS1 GTIN, a unique serial number, the packaging LOT number and expiration date in both human readable form and a machine readable GS1-encoded DataMatrix symbol. The Indian Directorate General of Foreign Trade requires all pharmaceuticals exported from the country to be serialized. A recent update to the regulation requires that labeling - covering the Global Trade Item Number (GTIN), batch number, expiry date and a unique serial number - is made available on the primary packaging in human-readable form, beginning June 30, 2015. Deadlines for secondary and tertiary packages were January 2014 and 2012, respectively. Recent serialization and traceability requirements make for a challenging and yet exciting time for the pharmaceutical packaging industry. Innovative efforts aimed at the development of unique packaging solutions and creative information systems will directly influence competitiveness in this emerging regulatory landscape. Federal R&D tax credits could play a strategic role in assisting companies through this period of regulatory transition. Credits are available to support both the developers of serialization solutions and those implementing serialization strategies. Emerging serialization and traceability regulations promise to go a long way in the fight against counterfeit pharmaceuticals. Innovative technology can help implement successful track-and-trace systems and contribute to detecting, deterring, and disrupting criminal efforts. Examples include the use of radio frequency identification (RFID) combined with tailor-made anti-counterfeit software. RFID consists in the wireless exchange of information between a tagged object and a reader, which allows said objects to be uniquely identifiable. The electronic tagging of products facilitates the creation and update of a chain of custody from the point of manufacturing to the point of dispensing. RFID tracking systems simplify the access to the so-called ePedigree, allowing manufacturers, distributors, and retailers to rapidly identify, quarantine, and report suspected counterfeits. 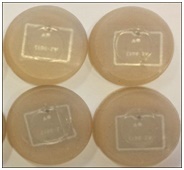 Different from barcodes, RFID tags are unique for all items and significantly difficult to copy or tamper with. Pfizer, GlaxoSmithKline, Purdue Pharma, and Johnson & Johnson are examples of major pharmaceutical players who have implemented large-scale item-level RFID tagging. Headquartered in Rensselaer, New York, Integrated Liner Technologies (ILT), a provider of caps and silicone septa liners for vials, pharmaceutical bottles, and test tubes, has recently introduced an RFID version of its products, designed to allow customers to verify the authenticity of products and track their electronic history. ILT’s Smart Septa system combines passive RFID tags with a software-as-a-service hosted server, which users can access to learn data about a tagged product. Forensic markers have also been proven effective in preventing counterfeit. These state-of-the-art solutions require laboratory testing or dedicated field test kits to scientifically verify authenticity. Examples include chemical, biological, and DNA taggants, isotope ratios, micro-taggants, and nano-printing. DNA taggants are particularly promising for the pharmaceutical packaging industry. Custom DNA sequences containing information (manufacturer’s name, facility location, etc.) are embedded into a host carrier, such as ink, which is then printed onto the packaging or label. By incorporating unique DNA sequences that cannot be reproduced, this technique offers an unprecedented level of security and constitutes an effective forensic means to verify a product’s legitimacy. Based in Stony Brook, New York, Applied DNA Sciences (APDN) delivers cutting-edge anti-counterfeit solutions through high-resolution DNA authentication. In March 2015, the company announced a landmark in the deployment of its SigNature DNA technology as a physical or chemical drug formulation identifier (PCID) in the pharmaceutical industry. APDN has successfully marked over ten thousand prescription drugs, acetaminophen gel-tabs, and aspirin tablets with DNA-embedded ink, and proven that such information is forensically detectable in a field-deployable format. The ability to authenticate drugs on the spot should greatly benefit the pharmaceutical industry. APDN expects that a combination of SigNature DNA with fast, simple, low-cost DNA analysis tools could be implemented in importation sites, central distribution locations, and large pharmacies or clinics, pioneering an unprecedented way to protect the pharmaceutical supply chain. The pharmaceutical packaging industry must be able to adapt to ever-evolving standards and regulations. The ability to innovate, creating new products and processes, is key for guaranteeing timely compliance and continued competitiveness. Federal and state R&D tax credits are available to support innovative companies in times of regulatory transition.